Sewing tables will help you stay organized, give you room to work, and support your machine with ease. No matter what your budget or space limitations, you can find a work table to fit your needs. 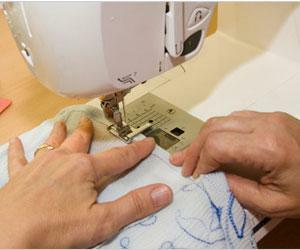 You can find sewing and craft tables at most big craft and sewing stores right in your area, but many crafters like to shop online for the best selection. When purchasing a table online, remember that the shipping costs can add $20 or more to the final price. JoAnn Fabric carries many tables online, from very simple ones to those that open up and have a variety of storage areas inside. The prices vary quite a lot, and shipping is extra. Sauder is one of the biggest suppliers of ready-to-assemble furniture in the United States. The company carries several types of craft tables and sewing storage solutions at reasonable prices. SewEzi is a simple sewing table that is designed to be completely portable and ergonomic. It folds and fits into its own case for on-the-go sewing. This is a big help if you are taking classes or are part of a quilting club. Amazon carries a large number of tables from a variety of different manufacturers. You'll find good options in many price ranges. Height: The table needs to be at a comfortable height for you to maneuver your sewing machine. The average adult needs a table with a surface that's about 28 inches off the floor, combined with a chair that sits 16 inches off the floor. If you are very tall or very short, your requirements will vary. Space: Of course you need something that fits in the space that you have available, but you also need to consider how much surface area you are getting. Once you put your machine on the table, will there be any room for a pattern book, extra fabric, or other things you might want to store on the table? Some sewing tables come with drop leaves for cutting fabric; if you have room for this, it is a great option. Storage: The main component that sets one sewing table apart from the next is the amount and orientation of the storage. Most of these tables have at least a couple of drawers built in, while some are quite elaborate and include storage bins, different sized drawers, and even bookshelves. Mobility: Do you need to be able to move your sewing table? Many tables are built on casters for mobility. Make sure that the model you choose has locking casters than can support the weight of the table and all that you plan to store on and in it. Materials: Do you want a more expensive, solid wood table, or will you be happy with a less expensive construction? One really quick way to make a table is to lay a hollow core door over two file or storage cabinets, one at either end. This provides workspace as well as storage. An even simpler possibility is to use saw horses to hold up the door. Just glue velcro around the edges of the door and add a pretty fabric skirt to hide the storage space underneath. Another great idea is to glue cork or vinyl to the top of your table so that you can use it for cutting, pinning, and other projects. If you don't have enough space to dedicate a corner or a wall for a sewing table, you can always use other tables you have in the house. A six-foot folding table that can be used for other projects makes a decent table, but be sure to consider the height. Many space-cramped crafters use their kitchen or dining room tables for sewing. Again, the height may be a little strange, but at least they are sturdy work surfaces. You might want to invest in a desk pad to put under your sewing machine so it doesn't scratch up your table. A designated table for sewing can make your craft time more relaxing. Rather than spending time getting the sewing machine out and set up, you can just sit down and begin to sew. You will be wasting less time setting up and putting away your sewing supplies, which ultimately gives you more time for doing what you love: sewing.